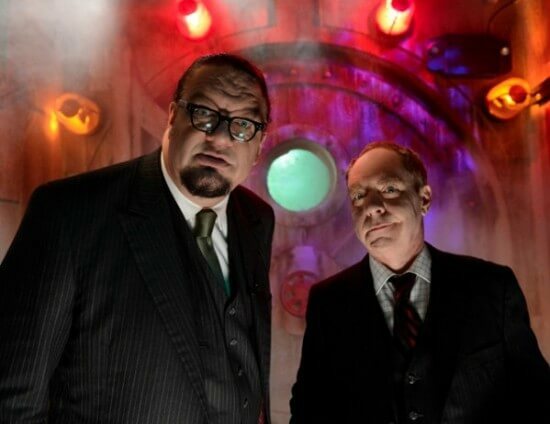 Universal Orlando has revealed details for a haunted house inspired by Penn and Teller for Halloween Horror Nights 2012 called “Penn & Teller New(kd) Las Vegas.” This fourth maze announcement confirms long-standing rumors we first shared in February of the magician duo’s involvement. The house, naturally, will be set in the world of Las Vegas, just as their real-life act is. But in the Universal’s Horror Nights story, a new trick involving a nuclear warhead goes horribly wrong and wreaks havoc across the city – and it will be presented in 3D. World-renowned magicians Penn & Teller have accidentally nuked Las Vegas, but don’t worry, it’s nothing a fresh coat of paint and a truckload of BS can’t fix! Come on down to New Vegas, where all that glitters isn’t gold, and in fact probably has fatal levels of radioactivity. The “truckload of BS” refers to their hugely popular Showtime television show that aired from 2003 to 2010. “Universal Horror Nights can scare the living Elvis out of you, and me & Teller, well, we’ve been known to take things a bit too far. Now we’re working together on showing you what it would be like to live in a post-nuclear explosion Sin City. C’mon by, but remember, you’re not playing with children here,” said Penn Jillette, the larger, louder half of the duo. “We’ve done more than just tap into the wildly creative minds of Penn & Teller, the most influential illusionists in the world. We’ve been working really closely with them. You are literally going to hear Penn directing you through this toxic wasteland before coming face-to-face with both Penn & Teller in this jarring 3D experience,” said Jim Timon, Senior Vice President of Entertainment at Universal Orlando Resort. Much like how the rumors began, the details of this maze did not first come through official Universal channels. The Orlando Sentinel first revealed details about the new house, followed by Variety, even before Universal has announced it. Yesterday morning, Penn Jillette tweeted he was “off to Orlando,” likely in town to continue work on the maze and shoot the promo images featured here, with his stage partner Teller. 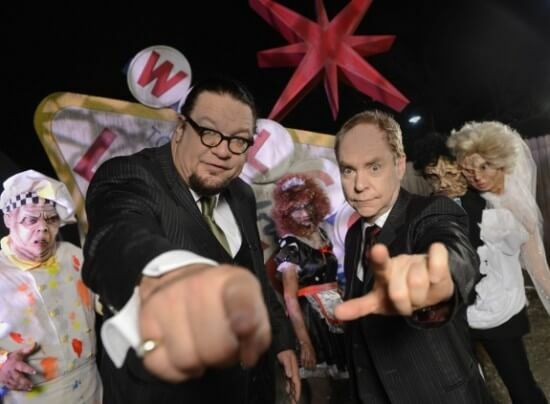 Elements to be included in Penn and Teller’s 3D maze include showgirls, slot machines, a buffet, a wedding chapel, and other Vegas cliches – all covered in radioactive goo. This Vegas-based house comes just one year after Halloween event competitor Busch Gardens offered a similar theme with their new Vampire Casino maze at Howl-O-Scream 2011. At Halloween Horror Nights last year, Universal Orlando also featured Lady Luck, with tie-ins to notions of gambling and chance. But Penn and Teller’s brand of Halloween-meets-Vegas will surely differ from those, injecting their unique sense of humor into the mix. Penn and Teller will appear in the house through videos and voice overs informing guests what happened with their botched trick. But they have expressed interest in surprising guests in person from time to time throughout the run of event, which kicks of September 21 and continues on select nights through October 31. This Penn and Teller haunted house announcement from Universal Orlando and the announcement made yesterday of the return of the La Llorona haunted house at Universal Studios Hollywood finally differentiates the two events this year, following three consecutively revealed identical maze themes for both coasts: Silent Hill, The Walking Dead, and Alice Cooper. Where each event is headed from here is anyone’s guess, but it’s likely the two will further branch out on their own with several more mazes, scare zones, and more entertainment yet to be revealed as the Halloween season rapidly grows nearer.